Churchill, Winston (1874-1965), Franklin Delano Roosevelt (1882-1945), and Others. 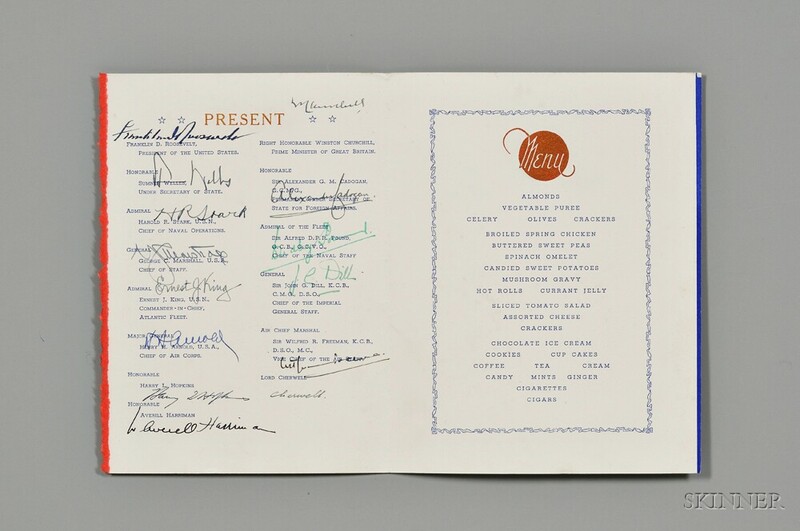 Signed Menu from the Atlantic Conference, 9 August 1941. 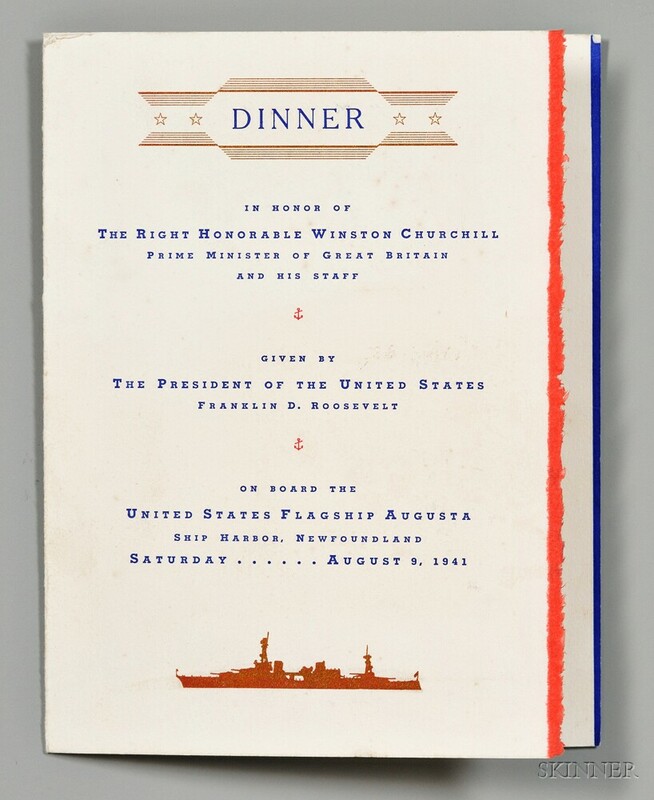 Folded menu printed in red, blue, and copper-colored metallic ink, commemorating the dinner served during the historic meeting of Churchill and Roosevelt aboard the U.S. Flagship Augusta where the Atlantic Charter was drafted; dignitaries present are listed inside on the verso of the cover, each has signed over his name: Franklin D. Roosevelt; Sumner Welles; Admiral Harold R. Stark; General George C. Marshall; Admiral Ernest J. King; Major General Henry H. Arnold; Harry L. Hopkins; Averill Harriman; Winston Churchill; Sir Alexander G.M. Cadogan; Admiral Alfred D.P.R. Pound; General John G. Dill; Air Chief Marshal Wilfrid R. Freeman; and Lord Cherwell; slight foxing to cover, a little stronger foxing on blank outside back, contents and signature page not affected, 9 x 7 in. [Together with] a black-and-white photograph of nine military men, including Archibald Wavell (1883-1950) and James Somerville (1882-1949), all signed, but most unidentified, the signatures faded away, 8 x 10 in.